Restaurant owners have a lot to worry about. From finances to marketing to day-to-day store operations, it can be easy to get overwhelmed. 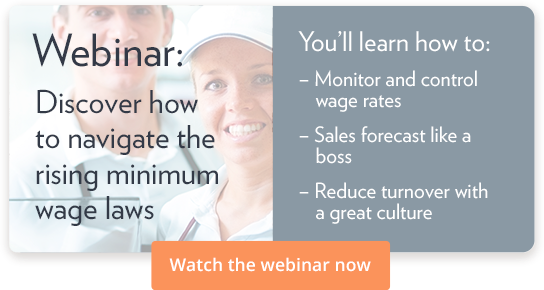 Government compliance is probably the last thing you want to worry about, but as a franchise owner, there are many regulations you need to adhere to when handling employee wages and hour tracking. With different requirements at the city, state, and federal level, it can be easy to make a mistake. We’ll dissect each mistake and provide tips to fix them. We’ll start with one you probably already know. Almost every state requires employers to provide breaks for their employees, and most also require a meal period during a full shift. But during a dinner rush, it can be easy to lose track of time. By the time things calm down, it’s not uncommon for team members to have inadvertently missed their scheduled break time, or worked straight through their meal time. For example, by law in Minnesota, employees must be offered a rest break every four hours for bathroom breaks, and that break must be paid if it is less than 20 minutes in length. Minnesota also requires that the operator must provide a 30-minute meal break for employees working at least an 8-hour shift. “Provide,” in this case, means that the break must be offered, but it’s not mandated. So, always make sure your employees know they have the right to take a break, and make sure you accommodate and build that into your scheduling, even if it means you need to increase staffing to make it happen. Plus, 30 minute breaks are unpaid, so operators may actually save money and hours by using them to rest employees and to more effectively manage labor costs. Make sure your store managers and employees know the laws in your state and give your whole team permission to hold people accountable for taking required breaks. Calculating overtime pay can be more complicated than you think. Federal law requires employees to be paid 150% of their normal wages for hours worked beyond the first 40. But if the employee’s hourly rate is below minimum wage (because their pay includes tips), it’s not as easy as multiplying their hourly rate by 1.5 for overtime hours. You need to multiply the minimum wage by 1.5, then deduct the tip credit from the total. Other factors, like tip pooling, can also affect how overtime is calculated. Your payroll software may already take these complexities into account, but it doesn’t hurt to double check. Here’s an idea you may have considered at some point. If exempt employees are always paid the same amount each pay period regardless of things like overtime, why not make all employees exempt? There’s a simple answer: you can’t. The Department of Labor specifies the types of work exempt employees can do. Just giving someone the job title of “Shift Lead” and making them salaried isn’t enough if that person is still performing all the same duties as every other team member. Exempt employees need to have some management responsibilities, or you could open yourself up to employee misclassification. Keep your team members hourly, unless their role truly merits a salary. Are you charging your employees for their uniforms? If so, this one’s for you. You are allowed to charge employees for uniforms, but only if the cost of the uniform doesn’t bring them below minimum wage for the time period. Tips don’t count towards that amount, either. If your employees are making minimum wage (or less, when factoring in tips), you need to cover the cost of their uniforms. Alternatively, you can simply provide employees with guidelines on what to wear — khakis and a red shirt, for example. Dress code guidelines aren’t considered uniforms, and you’re not on the hook for those costs. Did you know you may be required to provide your employees with parental leave? In Minnesota, employees who have worked for at least 12 months may take up to 12 weeks of unpaid parental leave, and their position must still be available when they return. Many states have similar laws, so make sure you’re ready to support your employees as they build their families. Give your employees parental leave, and be ready to welcome them back when they return. Making sure you’re compliant with wage laws isn’t just required, it’s the right thing to do. It’s your responsibility to take great care of your employees within the framework of the law.